The discovery was made when members of the Fuerza Coahuila police force were patrolling rural areas near Texas. Ciudad Acuña is directly south of Del Rio, Texas, where only the shallow waters of the Rio Grande separate the two nations. 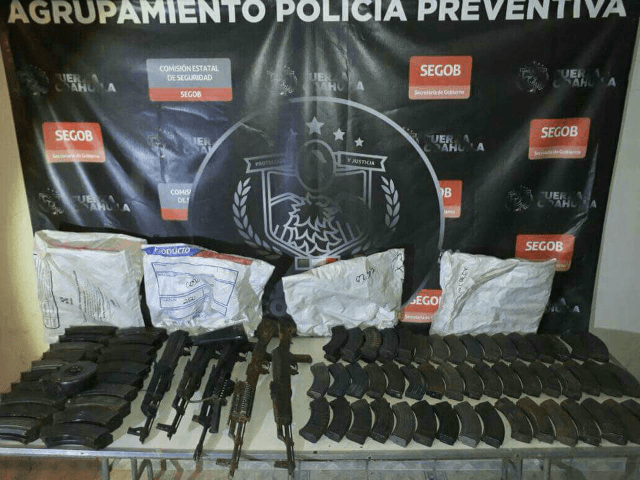 The lack of border security in the region allows drug cartels to use the area as a corridor to move large quantities of drugs and smuggle humans. In an abandoned property lot, the officers discovered various bags hidden in the brush. Inside were five AK-47 rifles, 10 magazines, and more than 900 rounds of different calibers. Also in the bags were packages containing close to 25 pounds of methamphetamine which authorities believe would have been smuggled north.